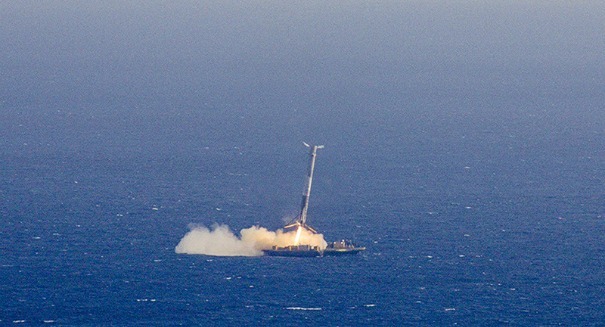 The first of now four failed barge landings of the SpaceX rocket is pictured above. A SpaceX rocket failed to land properly on a barge in the open ocean, the fourth failed attempt and a frustrating development for Elon Musk in his pursuit of the ambitious project. SpaceX has been trying to figure out how to consistently land a rocket safely after using it to launch a payload rather than simply dumping it into the sea, which could save space companies a huge amount of money and make space travel a lot cheaper and therefore more frequent. The company has been successful after a few tries, but the latest crash shows that there’s still a long way to go before it can be done consistently. The SpaceX Falcon 9 rocket successfully delivered a commercial communications satellite known as SES-9 into orbit, and then work began to try to get it safely down onto a barge in the ocean. However, the rocket landed hard on the barge — too hard, it appears, according to a CNET report. SpaceX has done four attempted landings on an ocean barge, and none of those four have worked out. It did successfully land a Falcon 9 rocket in December, but that was on land. Considering that many recoveries will have to be done at sea, that’s just not enough.